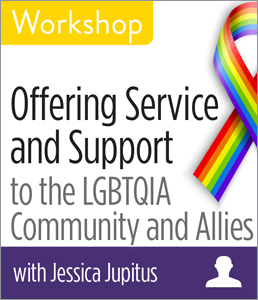 CHICAGO—ALA Publishing eLearning Solutions announces a new session of our popular workshop, Offering Service and Support to the LGBTQIA Community and Allies with Jessica Jupitus. This workshop will last 90 minutes and take place at 2:30pm Eastern/1:30 Central/12:30 Mountain/11:30am Pacific on Wednesday, November 28, 2018. Librarians are always thinking of ways to reach more users, make the library a more welcoming environment, and provide patrons with better services. With the increasing visibility of gay, queer, transgender, and gender non-binary issues, it has been evident that more people are interested in better understanding these communities and how to offer services that are both respectful and helpful. Information on sexuality and gender identity can be hard to find, and sometimes patrons are uncomfortable asking and discussing these topics. In this workshop, Jupitus will provide you with informative ways on how you can create a warm and welcoming space with visible allies to serve the lesbian, gay, bisexual, transgender, queer, intersex, and asexual (LGBTQIA) community and help develop your library services all at the same time. You’ll come out of the session with great programming ideas and strategies to get your administration and community on board. Jessica Jupitus is the Deputy Director of Library Service for Solano County Library and a former skater/coach for the Sac City Roller—“Lipstick Librarian.” Jessica won the ALA/Scholastic “@ your library” grant in 2012 with a week-long suite of LGBTQIA programming and has been committed to offering programming like Rainbow Family storytime and collaborative opportunities like the Q Prom with the local LGBT Center. In 2014, she was the recipient of a “Pride Award” for her work with the community and was named a Library Mover and Shaker in 2015. She has presented at libraries and conferences around the US on topics like management, service for the LGBTQIA community, and programming for folks in their 20s and 30s.